← What happened to the American Dream? During her visit to Wonderland, Alice had odd reactions to the weird things she experienced. Is President Obama trying to best her? `It IS the same thing with you,’ said the Hatter, and here the conversation dropped, and the party sat silent for a minute, while Alice thought over all she could remember about ravens and writing-desks, which wasn’t much. `I don’t know what you mean,’ said Alice. 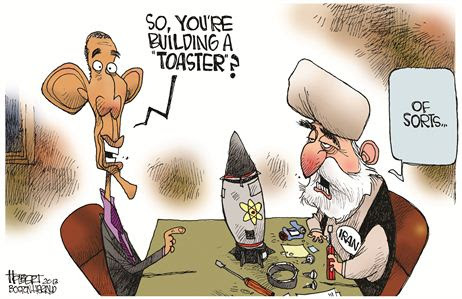 Iran’s continued development of nukes, warheads and delivery systems — along with her successful efforts to evade substantive responses to any questions about them during the P5+1 talks — seem to be riddles for President Obama. His own riddle posed in the above cartoon is as cute as any asked by the Mad Hatter; the answer of Iran’s Supreme Joker Leader is as responsive as any during the tea party. 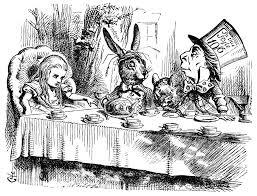 Only a tea pot, Mad Hatter, March Hare and Door Mouse upon which to lean are missing, and Secretary Kerry might well serve the same purpose as the Door Mouse. The answers there were on a par with that of the Supreme Leader to President Obama in the cartoon. President Obama’s statements to the public about Iranian nukes, as well as other topics including man-made Global Warming Climate Change, ObamaCare and unlawful statutory changes to it by Executive Decree for political purposes, have been equally gifted. The Israeli – Palestinian — Allah Will Gather Israelis So We Can Kill Them — “peace process” — as to which President Obama and Secretary Kerry appear to be pressuring Israel to yield to all Palestinian demands without regard to the increased if not existential peril in which doing so would place Israel, is not terribly different from the P5+1 process with Iran. It seem unlikely that the President Rouhani, the Supreme Leader and the Iranian negotiators have been experiencing persistent mushroom hallucinogenic highs and lows, but that is not self-evident with respect to President Obama, His Administration and the P5+1 negotiators. Unlike President Clinton, President Obama has never denied that he inhaled. It’s dreadful music to accompany concepts lifted from Alice in Wonderland. Would President Choom Gang Obama et al enjoy either or both? In view of their reactions to the Iranian riddles and all others I can think of at the moment, it seems probable that they would find at least the music appealing. The words probably cut too close to home. This entry was posted in Atomic bomb, Choom gang, Climate change, Constitution, Executive Decree, Fantasy, Freedom, Health Control, Insanity, Israel, Jonathan Turley, Khamenei, Law, Legislation, Libruls, Lies, Middle East, Netanyahu, Nonsense, Obama, Obama's America Now, ObamaCare, P5+1, Palestine, Palestinian Authority, Reality, Snark, Street drugs, United States of Obama and tagged Alice in Wonderland, Iran, Israel, obama, P5+1. Bookmark the permalink. Alice was a fictional character … if only Obama … oh, well.